Still Alice with Julianne Moore and Kristen Stewart. (See previous post: “'The Lazarus Effect' Box Office: Olivia Wilde Horror Movie Arrives Comatose.”) The Oscars do matter. As mentioned in the previous post, Alejandro González Iñárritu's Birdman was up an estimated 125 percent this weekend, Feb. 27-March 1, '15, following its four Academy Award wins – including Best Picture. Also up a hefty 24 percent – after adding 553 locations – is Sony Pictures Classics' Still Alice, which earned Julianne Moore the year's Best Actress Oscar for her performance as a woman in the early stages of Alzheimer's disease. True, an Oscar win – or key nominations – may not create mammoth blockbusters like Francis Lawrence's The Hunger Games: Mockingjay - Part 1, Sam Taylor-Johnson's Fifty Shades of Grey, or Clint Eastwood's American Sniper. For that, you need title recognition and/or a massive (and cleverly targeted) marketing blitz. But the Oscars clearly do help smaller movies such as Birdman, Still Alice, and James Marsh's The Theory of Everything (up an estimated 17 percent), which stars Best Actor Oscar winner Eddie Redmayne as Stephen Hawking. Directed by Richard Glatzer and Wash Westmoreland (The Last of Robin Hood, Sundance winner Quinceañera), on its seventh weekend out Still Alice raked in $2.69 million at 1,318 U.S. and Canadian theaters, according to estimates found at Box Office Mojo. Per theater, the family-psychological drama averaged $2,045. Also worth noting, this post-Oscar weekend, Still Alice managed for the first time to crack the Top Ten at the domestic box office. Still Alice's North American cume has reached an estimated $11.98 million, in addition to about $1.5 million from a handful of international territories. Not bad at all for a $5 million-budgeted drama dealing with highly disturbing issues: illness, death, the loss of self. Monday, March 2, update: According to official figures, Still Alice grossed $2.65 million, averaging $2,012 per site. Its current cume stands at $11.94 million. Julianne Moore's Still Alice co-stars are Kristen Stewart, Kate Bosworth, Hunter Parrish, Shane McRae, and Alec Baldwin. 'Maps to the Stars': Julianne Moore as Havana Segrand. Still Alice benefited from Julianne Moore's Best Actress Academy Award, but considerably less lucky this weekend was another Julianne Moore star vehicle. That's David Cronenberg's Maps to the Stars, strategically released so as to get some box office traction from Moore's Oscar victory. Co-starring Robert Pattinson (coincidentally, Still Alice co-star Kristen Stewart's leading man in the five Twilight Saga movies), Mia Wasikowska, Evan Bird, John Cusack, Sarah Gadon, Olivia Williams, and Star Wars' Carrie Fisher, Cronenberg's Sunset Blvd.-ish comedy has been hindered by both mixed reviews and an apparent lack of interest from distributor Focus World. But that's definitely not good enough for a small, not-at-all-mainstream-friendly movie in dire need of as much critical support as possible. For comparison's sake, Still Alice's Rotten Tomatoes score is 92 percent approval and 7.8/10 average among the site's top critics. Budgeted at a reported $15 million, Maps to the Stars collected an estimated $139,000 this weekend at 66 venues – or about 40 percent more than early estimates indicated. Even so, that represents only $2,106 per screen. Now, bear in mind that Maps to the Stars is also available on VOD. Pathetically, studios are reluctant to make public these increasingly important revenue figures. Monday, March 2 update: According to official figures, Maps to the Stars grossed $143,422, averaging $2,173 per site. Expect Maps to the Stars to disappear fast from U.S. screens. And there's little chance of it being remembered during the 2015-2016 awards season. David Cronenberg's film opened in the Los Angeles area last December – one daily screening for one week to qualify it for the Golden Globes. It worked: Julianne Moore did get a nomination in the Best Actress in a Motion Picture Comedy or Musical category. Never mind the fact that in early March 2015, few remember that Golden Globe nod. So, it's mind-boggling that distributor Focus World – a division of Focus Features, itself a division of the mega-conglomerate NBCUniversal – opted not to give Maps to the Stars a decent push in 2015 instead of a one-week, for-your-consideration-if-you're-a-mind-reader run late last year. Especially considering Julianne Moore's Best Actress win at the 2014 Cannes Film Festival. Needless to say, Maps to the Stars is ineligible for the 88th Academy Awards. Cult classic in the making? But all isn't necessarily lost. Don't be too surprised if Maps to the Stars resurfaces as a cult classic a decade or two from now, with Julianne Moore hailed as the Gloria Swanson / Norma Desmond of the early 21st century. * The 2015 Canadian Screen Award winners were announced on Feb. 28. Xavier Dolan's Mommy swept the awards, with nine wins including Best Picture. Maps to the Stars won two awards: Best Supporting Actor for John Cusack, who beat fellow player Robert Pattinson, and Best Original Score for Howard Shore. Julianne Moore lost the Best Actress Canadian Screen Award to Anne Dorval for her titular performance in Mommy. Peter Sollett's Freeheld, based on the real-life story of a lesbian couple battling terminal illness, financial issues, and prejudice. Moore will once again be playing a dying woman. Ellen Page is her lover. Also in the Freeheld cast: Steve Carell. Luke Grimes. Michael Shannon. Mary Birdsong. Dennis Boutsikaris. Screenplay by Ron Nyswaner (Philadelphia, The Painted Veil). Cynthia Wade's Freeheld (2007) won the Academy Award in the Best Documentary Short category. Francis Lawrence's The Hunger Games: Mockingjay - Part 2, the final installment in the Hunger Games franchise starring Jennifer Lawrence, Josh Hutcherson, and Liam Hemsworth. Also in the Mockingjay 2 cast: Sam Claflin. Elizabeth Banks. Willow Shields. Jena Malone. Natalie Dormer. Philip Seymour Hoffman. Stanley Tucci. Woody Harrelson. Donald Sutherland. Robert Knepper. Toby Jones. Jeffrey Wright. Additionally, Rebecca Miller's comedy Maggie's Plan is in the pre-production stages. Moore is supposed to star opposite Travis Fimmel, Ethan Hawke, Maya Rudolph, and Bill Hader. “Still Alice vs. Maps to the Stars: Julianne Moore Oscar Helps One Film” is an updated and revised version of an article initially posted on Feb. 28, '15. Kristen Stewart and Julianne Moore Still Alice photo: Sony Pictures Classics. Julianne Moore in Maps to the Stars photo: Focus World. 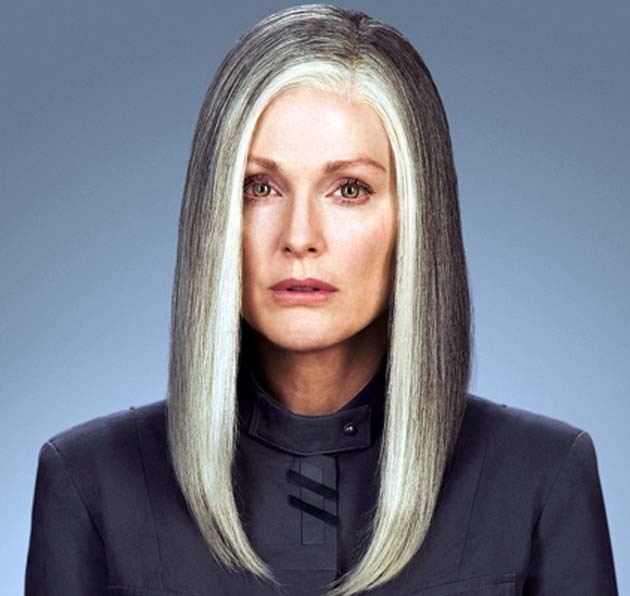 Image of Julianne Moore as President Alma Coin in The Hunger Games: Mockingjay - Part 1: Lionsgate. You made no mention that 1 movie was picked up by Sony and promoted to the heavens before the Oscars and the other movie picked up and hidden in the 'slump' following the Oscars and given zero promotion by Focus and zero promotion by the Oscar winning actress although she attended in excess of 30 events to promote (herself) before the Oscars In Still Alice. Shame on her. Still A is very very Oscar baity. Cronenberg is never ever Oscar baity. Yes I know what your title says but the article gives you away I'm afraid. Didn't realise you were such a Stewart fan. Good luck with that. Strike the words 'range' and 'accents' from your repetoire you won't need them. It's sad to see you analyse films only in yerms of BO tbh because Still Alice is a very ordinary movie with an excellent performance. Films like that make for a better RT score that a film which will maybe polarise an audience like MTTS but love or hate it you can't ignore it and you will remember it. By next week people will be asking. What was that movie JM got her Oscar for?? First: both Cosmopolis and Maps to the Stars have 64% on Rotten Tomatoes. You can't compare Still Alice and Maps. Still Alice has everything to make it: a very good performance of the lead, an appealing story that is “Americanized” to sell better. Amour, Palme d'Or of the Cannes Film Festival in 2012 was also about Alzheimer but it was shown in a more realistic, raw way and didn't do that well in the States. Btw, Emmanuelle Riva should've gotten the Oscar instead of Jennifer Lawrence but we know the politics behind the Oscard, don't we? I've read several times critics and viewers' opinion that Moore deserved the Oscar for Maps better then for Still Alice. Maps to the Stars isn't a film Hollywood will welcome and Cronenberg is aware of that of course. The total lack of promo is a real shame. You can't expect people to watch a film in theater when even the fans don't find where it plays. As explained in the article, the “Cosmopolis” and “Maps to the Stars” approval ratings are from Rotten Tomatoes' top critics. Also, the article isn't a “comparison” for obvious reasons. It's about Julianne Moore's Oscar effect, as clearly pointed out in the title. Now, didn't Emmanuelle Riva's character suffer a stroke in “Amour”? Which, considering its theme and origins, was a remarkable success in the U.S.
what happened to the screaming fans of Robert Pattinson, those who leave her husband and children at home to follow the boy to London Premiere? Is this article supposed to provide some sort of analysis? When comparing apples and oranges, it is best to find something tangible to compare. Although Julianne Moore is in both that's where the similarity ends. Marketing, theater counts, VOD, subject matter etc, make this an impossible comparison. I live in San Francisco. Still Alice is literally playing at almost every theater here (large and small). Maps to the Stars is playing at a single, small, neighborhood theater tucked away in the avenues. There has been no advertising what's so ever. As a Cronenberg fan, I was aware and during my screening Friday there were about 20 others who searched it out. It really is a shame though. This is one the best of Cronenberg and Moore's performance here blows her pretty fantastic performance in Still Alice out of the water.